Have your gluten free peach cobbler and ice cream all in one with this super easy and delicious recipe! I haven’t even left for Wisconsin and, by the time you read this, I will already have been there for a week AND come back. I don’t even know if that makes sense. Whatever. HOW-EV-ER, I knew that I would have no time to write in Wisconsin, and I am probably sleeping my life (and by that I mean, just sleeping in a couple extra hours) away right now, so I’m prepping in advance. Taylor from the past. This post is gettin’ freaky. There are a few things that you should know about Mondays. They are the only day of the week that start with “M.” See above. 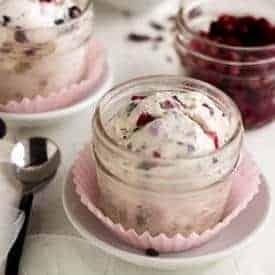 I have been SO pumped to share this recipe with you for a while because BOTH the hubs and I declared it THE best ice cream that we have ever eaten. No lies. Only ice cream. The concept of eating some sort of fruit cobbler with a big scoop (read: the whole carton) of ice cream on the side is nothing new and thrilling. I’ve done it with some gluten free peach cobbler from allergylicious. And if it is, well, I’m sorry to tell you that everything you ever knew was a lie, and you have been completely and utterly deprived of life. BUT, have you ever eaten your cobbler IN your ice cream? I. KNOW. I can’t lie to you (remember: only ice cream) the concept of peach cobbler was a wee bit new to this Canadian girl. I grew up eating apple cobbler left, right, center, up AND down…but we didn’t make it with peaches ever. And then I crossed the border and suddenly it was peaches in ALL the cobblers. So this ice cream is also my attempt to prove to America that giving me a green card was a great idea, and that I have assimilated nicely. Or something like that. Sorry, I am too busy re-eating this in my brain that I didn’t realize I was talking about nothing. 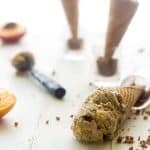 I originally shared the Peach Cobbler Ice Cream recipe on The Kitchen Prep for her fun, themed week called “Ice Cream Social!” Make sure you check out Diana’s beautiful blog! P.s Does Monday have a face? In a large sauce pan over medium heat, combine the half and half, 3/4 cup 2% Milk, Agave, salt and cinnamon. Cook, stirring constantly, until it comes to a boil. While you are waiting for the milk mixture to boil, whisk together the cornstarch and remaining milk until the cornstarch is well dissolved. 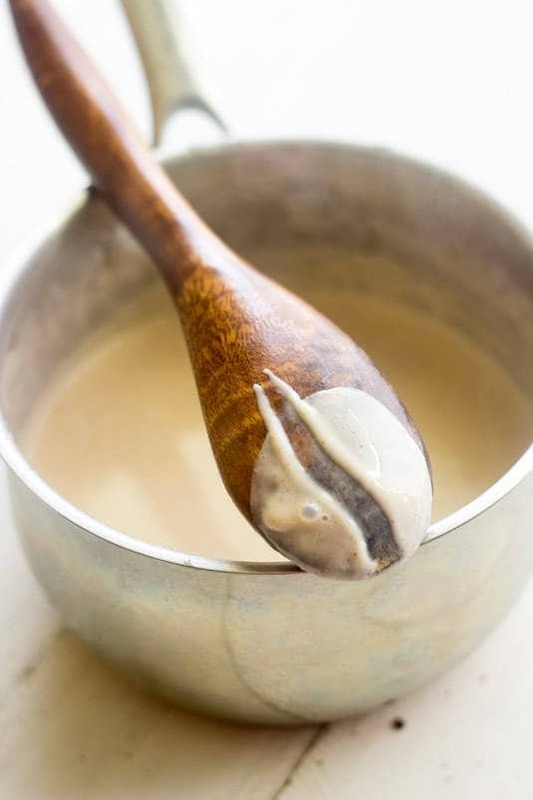 Stir it into the milk mixture once it begins to boil, whisking well to ensure that the cornstarch does not get lumpy. 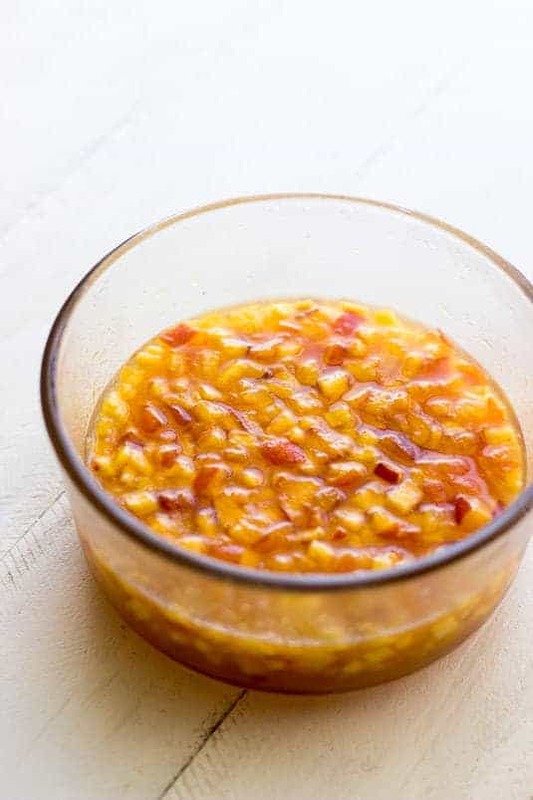 Boil on medium heat, stirring constantly, until the mixture thickens and coats the back of a spoon, about 7 minutes. Take the pot off the heat and place a fine strainer over top. Pour the peach mixture into the strainer so that only the juices are released into the milk mixture. Cover the peaches and place back into the refrigerator. Whisk in the vanilla extract, and stir until well combined. 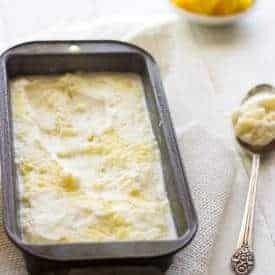 Let the mixture cool to room temperature and then transfer to a covered container and refrigerate for at least 6 hours. While the milk mixture cools, preheat your oven to 375 degrees and line a baking sheet with parchment paper. In a large bowl, combine the diced pecans, oat flour and brown sugar. Stir until well mixed. Pour in the melted coconut oil and stir until fine crumbles form. Once the milk mixture has chilled, process according to your ice cream makes directions. Add the crumbs and diced peaches in during the last few minutes of churning. DEVOUR immediately as soft serve or place into the freezer for 2 hours to let the ice cream harden. 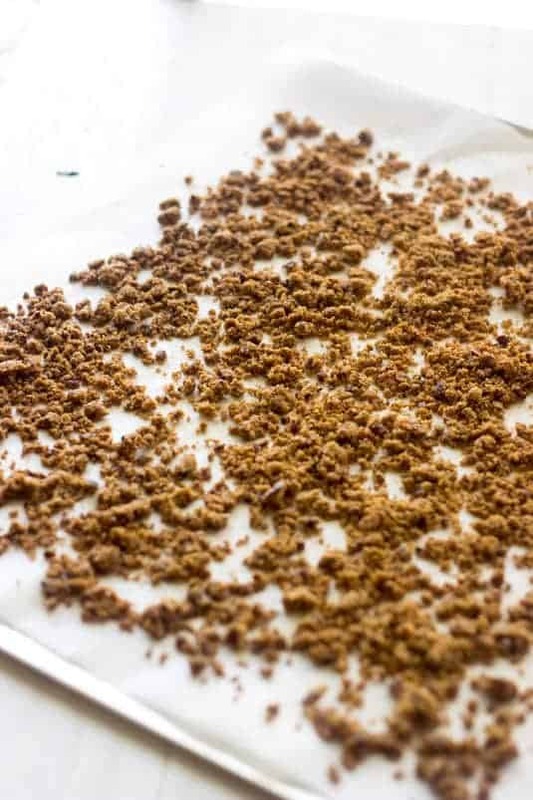 *Your crumbs will feel soft when they come out of the oven, but they crisp up once cooled! Wait, Canadians don’t eat Peach Cobbler? It’s the best kind! And Peach Cobbler ice cream sound devine. Hope you had a good vacation. Right?! Clearly, we are missing out up north! I sure did, just trying to play catch up now..ugh! Thanks girl! 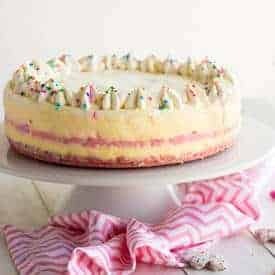 Wow, this does look amazing! I love cobbler– actually, who doesn’t?! And cobbler isn’t cobbler without ice-cream–so this is actually the perfect concoction! Beautiful pics by the way!! Then you will love this Emily! Thank you SO much! I am in total agreement with your Monday facts. Love this flavor of ice cream too! Peaches have to be my favorite fruit! Thanks so much Mallory! Happy Monday! Mondays really ARE better with ice cream! Mine is off to a slow and tired start so I’m really glad you shared this delicious recipe! Can’t wait to give it a whirl! Mmmmmmmm ice cream and pie in my face…I’ll take it!!! And welcome back, Taylor from the past. If that even makes sense? So yum! Yes, her in America we love our peaches! Especially down south 🙂 Love that you added whiskey to this because what is life without a little whiskey? Exactly. You understand life and that is why I love you. 😉 Thanks girlfriend! We’re heading out on vacation soon and I’ve been working on posts to go out while we’re away and the day after we come back (so I can sleep in too!) It’s so strange to write posts that far in advance! This ice cream looks fabulous! Haha! I am SO glad I am not the only one who pre-plans like that and also feels it’s strange! Thanks Martha! Looks scrumptious Taylor and I love the super simple part! Haha! Thanks lady! And a happy Monday to you! I knew there was a reason I liked you Michele 😉 Thanks girl! This looks fantastic! I rarely make ice cream, but after seeing these pics, that is surely about to change! I am going to Wisconsin (Washington Island, it’s in Door County) next week. Where do you go? And, thank you so much! Home made ice cream is the best! Hope you had a wonderful time in Wisconsin, Taylor! I was just up there this past weekend, at my husband’s summer home. It was so nice to relax in the sun, but I’m happy to be home! This ice cream looks AMAZING! Peach cobbler is my favorite dessert, so I can only imagine how tasty it must be in this ice cream. Definitely makes Monday a little bit better! Yep, totally agree ice cream makes Mondays better! Just imagining this deliciously genius Peach Cobbler Ice Cream is making my day better already! Thanks for starting me off right!! and SO glad you came to America and found Peach Cobbler – it’s the best!! I hope you sent the news back to Canada :). Thanks for a great recipe, Taylor, and beautiful photos as always! Thank you so much Girlfriend! 😀 Happy Monday! This ice cream sounds AMAZING!!! Pinned!! I’m in love with pie IN ice cream! this sounds amazing Taylor!! haha ice cream DOES make Monday’s better! Right on Taylor! Glad you were so prepared before you’re trip! I bet that helped you not worry about your blog as much. How was Wisconsin?! Did you have a great trip? I hope you talk about it later this week 🙂 Have a WONDERFUL Monday – that’s filled with eating this ice cream of course! It sort of helped..but I worry to much naturally haha. Wisconsin was great! But it’s nice to be back, cooking and sleeping in my own bed, you know? There will be a recap with pics…but next week! Thanks girl! Back at ya! Yummy!! I super love peaches. Hope you enjoyed your time off! I sure did!! But, it’s nice to be home. Thanks Francesca! Do it! Monday deserves all the ice cream! Thanks lady! Haha, IF Monday did have a face, I doubt it would look as ah-mazing as this ice cream! I can’t wait to try this! Yay! Thanks you heaps Nichole! Amazing!!! Love this!!! Totally pinned!! LOL “ALL THE YUM” Love that. Great recipe girl! I love these photos! And the ice cream looks delicious too. Definitely pinned! I also live in Wisconsin, where did you travel to? Love love love this! I want to go on the “eat ice cream everyday” diet. This looks so good Taylor! Looks amazing! I seriously love everything about this! In your face Monday is right! Boozy ice cream is definitely the best thing that has ever happened to a Monday! This sounds so delicious – I can’t get enough peaches these days!! 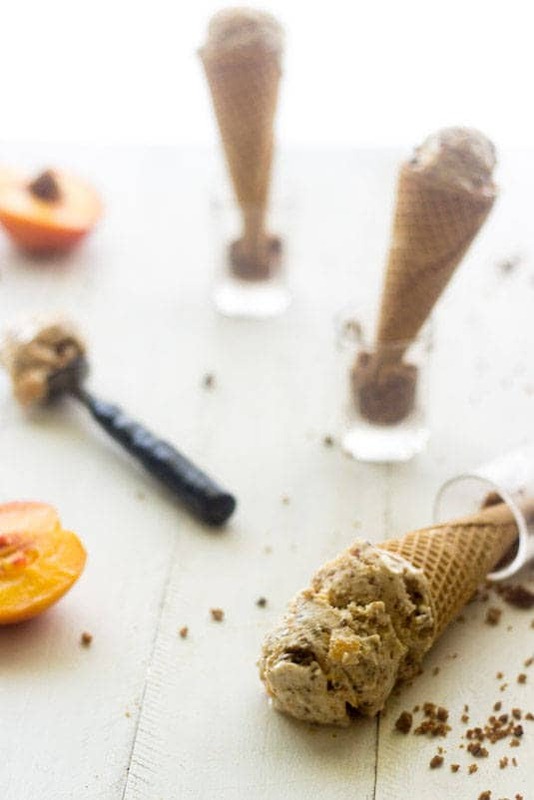 Taylor, we are TOTALLY on the same ice cream wavelength—I just recently shared my fav ice cream recipe to date on my blog a few days ago, and then you go and post this GORG peachy-keen ice cream! Seriously, peach cobbler in an ice cream?! DYING. Need this in my face pronto! This looks seriously too good to be true!! your shortest comment..but the most meaningful 😉 Thanks lady! It is SO not wrong to have it for dinner…especially when you broke it into such a whole, perfect meal! The waffle cone for carbs? Genius!! What a killer recipe! Yum! Jack Daniels, peaches, ANDDDD crumbles, in one recipe?!?!?! You got the way to my heart, girl. I knew there was a reason that I loved you 😉 Thanks lady! Peach cobbler + ice cream = match made in heaven. 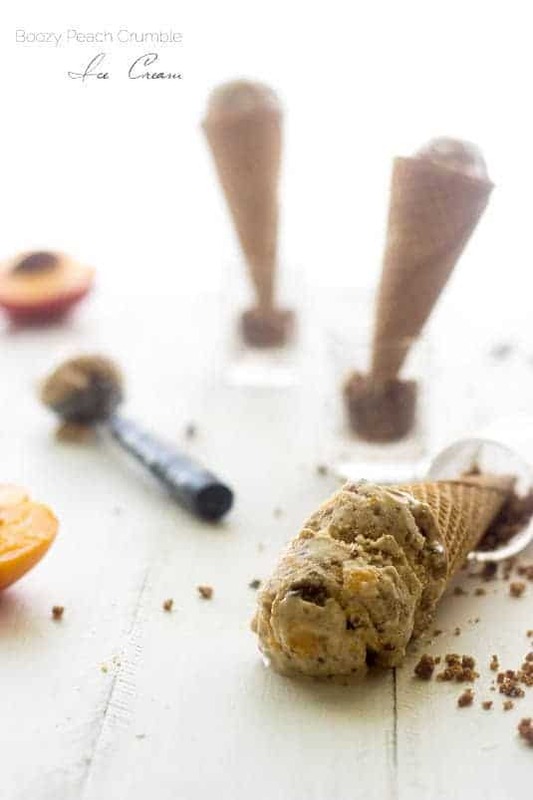 Peach cobbler ice cream = genius! Peaches, booze and ice cream. Perfection! Glad you agree! Thanks Sharon! There’s nothing better than peach cobbl…… wait, what?! 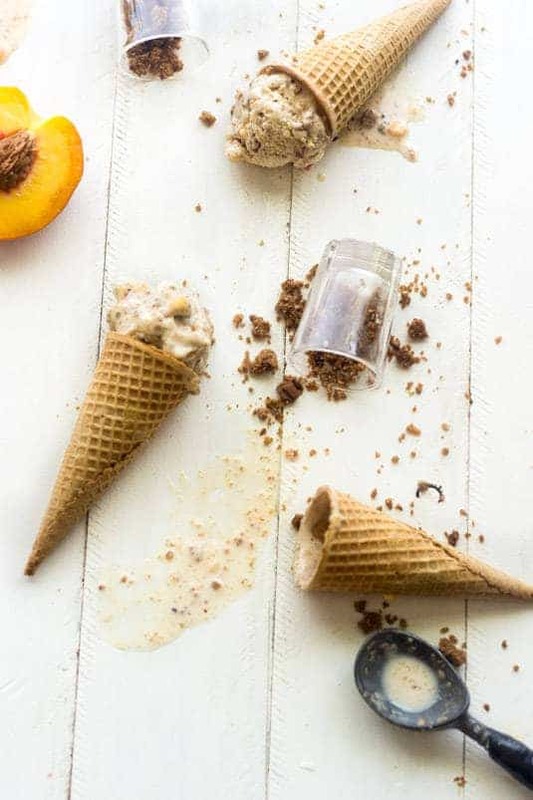 You just turned peach cobbler into ice cream?!?!?!?! Uhm, I am not worthy… I am not worthy! This is incredible!! Haha!! this comment made my night. Thanks Chris! Love your recipes and this ice cream is no exception. Cant wait to make this one.